Laura Davis Hays was born in Whittier, California, the only child of a theoretical physicist and librarian. When she was five, he family moved to Livermore, where her father, Don, worked at the Lawrence Radiation Lab. When a young chicken wandered into the backyard from the adjacent farm, he became the first of a series of bantam rooster pets. The backyard was a garden paradise for chickens and young girls and a mother with a green thumb. At night, Laura’s father read her adventure and fantasy stories, and taught her math. Laura began studying classical piano when she was nine, and so began her lifelong love of music. Jim and Laura live in and adobe house. Jim is a builder and Laura writes whenever she can, and plays piano on Sundays at Everyday Center for Spiritual Living. They ski in the winter, and enjoy watching the spectacular sunsets from their back porch. Every few months, they travel to LA where they visit Gabe, his wife, Holly, and their two beloved granddaughters, Sadie and Gemma. In smart and elegant language, Hays deftly weaves equal parts of science, romance, adventure and fantasy into a captivating novel that invites the reader to consider the interconnectedness of the past, present, and future. 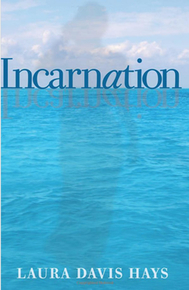 Incarnation is the story of a scientifically trained young woman faced with improbable psychic events. French-born Kelsey Dupuis takes a new job working in a genetic engineering lab in the high desert of New Mexico. There, the oceanic nightmares begin, soon escalating into waking visions, warnings, and finally visitations from a dark-braided, green-eyed girl named Iriel. As Kelsey seeks the truth, she learns Iriel escaped an arranged marriage in her own time, and lived to witness the destruction of her ancient homeland, helpless, despite her formidable powers, to stop it.